The founder of S. B. Kraus was Solomon B. Kraus (1864-1940). He applied for a passport in 1904 when he said he was born 2 January 1864 in Zirndorf [near Nürnberg], Bavaria, Germany, 2 January 1864, that he emigrated on the SS Wieland from Hamburg 15 June 1881 and that he became a naturalized American citizen 6 January 1887. He was a dealer in paints in the 1900 U. S. Census. He lived with his brother, Samuel Kraus, on West End Avenue, Manhattan, in 1910. He lived with his brother, Isaac Kraus, on West End Avenue, Manhattan, in 1920. He was a boarder with George Baldwin, a vacuum cleaner salesman, in Eatontown, Monmouth County, New Jersey, in 1930. He died in Eatontown, NJ, age 76, 18 February 1940, and he was buried in Maimonides Cemetery on Jamaica Avenue, Brooklyn. Solomon Kraus's brother, Isaac Kraus (1857-1933) lived with Solomon at 411 West End Avenue, Manhattan, in 1920. They both were recorded as "Chemist, Chemical Mfg. 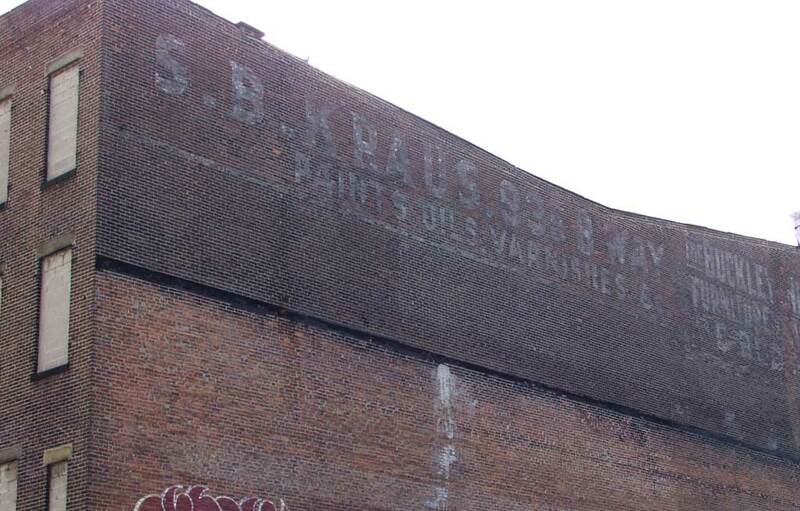 Co." Located at 635 Broadway, Brooklyn, along with S. B. Kraus, Paints, was Kraus Chemical Works. In 1938 Kraus Chemical Works at 935 Broadway, Brooklyn, registered a trademark for their War On Roaches roach powder. Kraus Chemical consisted of Solomon Kraus and Max Kraus. Max Kraus (1884-1978) was also employed at S. B. Kraus. According to his passport application from 1906, Max Kraus was born near Fürth, Bavaria, Germany, 6 September 1884. (Fürth is close by Zirndorf.) He emigrated from Hamburg on the SS Kaiser Friedrich 24 August 1900, and became a naturalized American citizen in Brooklyn 26 May 1906. He was a nephew of Solomon B. Kraus. He registered for the World War I draft in 1918 when he was employed as "Manager, S. B. Kraus, 935 Broadway, Bklyn, Kings, NY." Twenty-four years later in the 1942 World War II draft registration he was employed "Self, 935 Broadway, Brooklyn." He was one of two executors of Solomon B. Kraus's estate in the 1940s when he lived at 29 Washington Square West, Manhattan. He continued to live at this address into the 1960s, and then died in Berkeley, California, February, 1978. This ad for S. B. Kraus appeared in Upington's General Directory of the Borough of Brooklyn, 1908. The business was located at 657 Broadway, Brooklyn, from 1891 to the early 1900s. This ad from 1894 shows S. B. Kraus at 657 Broadway. In 1904 a Brooklyn city directory listed them at 935 Broadway. This address is two doors east of 929 Broadway where the sign was painted. S. B. Kraus & Co. were listed in the Brooklyn telephone directory at 935 Broadway through 1964. Apparently the business manufactured paints, oils, etc. in addition to selling them retail. This ad for Krauscote Pure Lead and Zinc Paint dates from 1930. The claim "since 1860" seems unwarrented unless there was some predecessor Kraus in business before S. B. Kraus was born. This ad headed Do You Buy Paints Blindfolded? dates from 1932. This ad for Medusa Masonry Paint dates from 1952. S. B. Kraus at 935 Broadway is one of two sources for this product.